A determined domestic thrust is under way to compress Israel back into its precarious pre-1967 frontiers, imperiling the viability of Jewish sovereignty. Four percent of the country's residents [i.e. the settlers] cannot decide that they are the only ones who know what's right... It's hard not to respect those who are willing to risk their lives and future for the sake of a goal they believe in, yet it becomes a whole different story when they risk the lives and future of others. ... there is room for well-considered, controlled unilateral actions. Such actions, which are not dependent on the standing of negotiations, can mitigate the conflict by creating an evolving reality of two states. They should take place along with consistent efforts to negotiate a permanent arrangement, or at least diplomatic agreements that would ultimately result in a permanent arrangement. I have a strong premonition of dire things to come. For there are increasingly frequent signs of the ominous nature of the emerging realities that soon will be upon us  signs clearly visible to all but those who refuse to acknowledge them, and realities which if left unchecked will  with almost deterministic certainty  herald the end of the era of Jewish sovereignty in our time. The three preceding citations aptly illustrate the reasons for my concern and the sense of impending doom that accompanies it. For they clearly mark out the major lines, along which the thrust of a new domestic effort is being mounted to compress Israel back into its precariously vulnerable pre-1967 frontiers, and to reinstate the validity of the policy of unreciprocated withdrawal, despite the debacle of the disengagement. It is important to note the metamorphosis that has taken place in the rationale of the two-state doctrine. For in contrast to the not too- distant past, withdrawal from the territories across the 1967 Green Line is now no longer presented  as least not, primarily  as a measure designed to attain a peace accord with the Palestinians. Rather, it is portrayed as a desired value in, and of, itself. Today, territorial retreat is being promoted as a standalone moral imperative which must be aspired to, no matter what the peace negotiations with the Palestinians achieve. Or don't. Unilateralists employ two ruses to disguise the true nature of their endeavor  one involving semantic cosmetics, the other substantive camouflage. They attempt to mask their push for unrequited concessions with misleading, almost Orwellian rhetoric, virtually indistinguishable from the Newspeak slogans in the dystopian realities of 1984, such as "War is peace," "Freedom is slavery" and "Ignorance is strength." This is no exaggeration. For what more fitting epithet could there be to characterize the unilateralists' bizarre practice of designating their call for complete capitulation as "constructive" (see my "The coming canard: 'Constructive unilateralism,'" April 19). This could be plausibly construed as prescribing a macabre maxim that could have come directly from the manuals of the Orwellian Ministry of Truth: "Surrender is Victory." Together, with this semantic sleight of hand, they continue to insist that their preferred avenue is a negotiated settlement with the Palestinians. But this too is little more than superficial posturing that lacks any credibility. After all, why would the Palestinians feel the need to negotiate when they are being "threatened" with being given virtually everything that they could get via those negotiations anyway  courtesy of "constructive unilateralism." Unless of course one is contemplating offering even more munificent concessions in such negotiations, such as the right of return, east Jerusalem and the Golan, as per the demands of the Arab Peace Initiative. It is against this ideo-political backdrop that the grim scenario I envisage will unfold. As the growing specter of international economic, and other, sanctions looms ever-larger and more menacing, public concern will be harnessed to fan the flames of resentment toward the designated cause of these potential punitive measures against the country  the continued Jewish presence across the 1967 Green Line. Although radical post-/anti-Zionist elements will continue their support for the BDS (Boycott, Divestment, Sanctions) movement, establishment CUPs will not publicly call for such steps against Israel. Privately, however, they may well let it be known that they feel that tangible threats thereof might have a valuable role to play. They will write articles and give interviews in the mainstream media, warning that such penalties are imminent, thereby signaling to foreign governments that such action is, in their eyes, understandable, even, regrettably, appropriate. As such threats become more credibly conveyed and are seen to be more tangibly imminent, they will be brandished domestically by CUPs, and increasingly portrayed as an unwarranted and avoidable punishment brought down on the general public by a handful of recalcitrant, radical ideologues. Then, a well-orchestrated campaign to discredit the residents of the Jewish communities of Judea and Samaria will begin. They will be portrayed as the source of economic burden and physical danger to the rest of the population living within the pre-1967 frontiers  as reflected in the foregoing Lapid excerpt  and as the sole impediment to a peace accord with the Palestinians. Although some non-adversarial appeals will be made for "our brothers across the Green Line" to return home, and expressions of understanding, empathy, even identification as to their suffering may be articulated, this will do little to dilute the venom that will be directed at them. The deep-seated, primal distaste for the settlers will soon engender defamatory and demagogic diatribes against them that will range from the distortive, through the deceptive, to the downright deceitful. In parallel, a drive will be launched  in fact, in large part has already been launched  to accustom the public to the notion of "constructive unilateralism" and to persuade it of its acceptability, indeed, inevitability. Conferences will be staged with compliant, high-profile participants to impart "intellectual depth" to this shallow, capricious concept; opinion polls will be conducted, with questions carefully crafted to elicit responses that can be portrayed as reflecting widespread public endorsement; opinion pieces will be published/posted and prime time interviews granted in mainstream media channels  at home and abroad  with sympathetic editorial policies, to build up pressure on politicians and policy-makers. Soon a "95% Us vs 4% Them" theme will increasingly dominate the public discourse, and a "Pre-1967 Israelis vs Trans-Green Line Settlers" schism will purposely be widened and systematically popularized. With growing frequency and aggressiveness, elected leaders will find themselves publicly confronted with trenchant, but disingenuous, questions of the kind: "Why should 95% of the population pay the price for, and bear the burden of, the ideological intransigence of a 5% minority." And as in the past, the elected leaders will not withstand the pressure. Recently, pro-settler/anti-withdrawal advocates have pooh-poohed the idea of imminent Israeli withdrawal from Judea-Samaria. They claim that given the precedent of the disengagement, and of other forced evacuation episodes, no government could countenance the involuntary evacuation of tens  much less hundreds  of thousands of Jews from their homes, and hence withdrawal is not a feasible prospect. They are right  and they are wrong! It is unlikely that any Israeli government could or would undertake a massive forced evacuation of Jews. But this does not discount the possibility of unilateral withdrawal. For what was once unthinkable is no longer so. Announce that Israel has no claims to sovereignty beyond the security barrier  or thereabout. Instruct the IDF to prepare for a unilateral withdrawal to that prescribed line within, say, six to nine months. 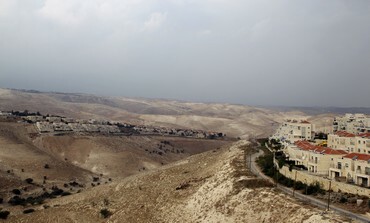 Inform the residents of the Jewish communities across the Green Line that the IDF will withdraw in six to nine months, in which time they will have to decide: Either accept a modest relocation compensation package or remain where they are, to live under the rule of whatever regime will assume power in the region. Unthinkable? I beg to differ. Sever Plocker, a very well-connected journalist, recently (May 20) wrote: "Sources close to the prime minister... speak of his growing willingness to take a dramatic unilateral step for the Palestinians in case the proposal for temporary borders and an interim agreement does not reach the implementation stage." Strongly corroborating the concern expressed by David Weinberg in the introductory except, Plocker continues: "According to the sources, Bibi is closer than ever to reaching a decision on a unilateral withdrawal near the separation fence, without getting anything in return from the Palestinian Authority. He is prepared for a 'historic act that would surpass the disengagement from Gaza.'" The history of recent decades is replete with incidents in which the once-taboo has become the accepted policy of the day. Who, in the 1980s, would have believed that the rugged, hawkish Palmahnik Yitzhak Rabin would embrace and sanitize the archterrorist Arafat; who, in the 1990s, would have believed that former right-wing Likudniks like Ehud Olmert would offer to divide Jerusalem; who, in 2000, would have believed that the super-hawk Ariel Sharon would coercively evacuate Gaza, or that Netanyahu would embrace the idea of a Palestinian state. Time and time again, Israeli leaders have buckled under pressure  perceived or genuine. Time and time again, they have reneged on electoral pledges and embraced the dovish concessions they previously scorned. There is little reason to believe  or even to hope  that they will not do so again  especially if confronted with the seeming choice of giving the welfare of a 95% majority precedence over the "ideological excesses" of a 4% minority. This of course would be a calamitous decision and in all probability, would precipitate a process that, within several decades, culminate in end of the era of Jewish sovereignty. It would comprise a grotesque inversion of the Zionist ethos, which in essence involves bringing Jews living under alien sovereignty to live under Jewish sovereignty  not abandoning Jews to live under, not only alien, but in all likelihood inimical sovereignty. Proponents of the move would soon find  as with the Oslo debacle  that the euphoria would be rapidly replaced by horror and despair. The preceding scenario is a tangible possibility. Help prevent it materializing. Raise you voice in protest. Withdraw support from any elected incumbent who does not actively and effectively oppose its implementation. Help fund countervailing conferences and conduct contradictory surveys. It is not that much is at stake. Everything is at stake! Please help me to prove my prediction wrong.